If you've ever yelled "DAGNABBIT!" 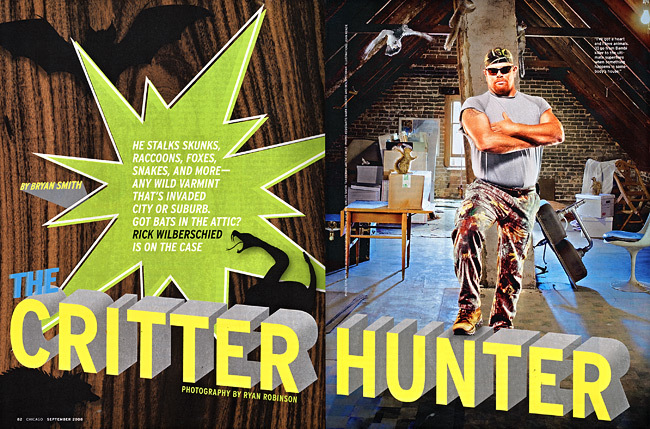 because some gosh-darn varmint was trapped inside of your attic, you should have called Rick from All Thats Wildlife. Check him out in this months spread for Chicago Magazine. We had a blast shooting up in an attic during the blistery 100˚ afternoon heat. A big thanks to my crew, Mark & Ben for sweating their asses off and lugging that useless air conditioner 3 flights of stairs!